The idea of Kerala conjures up a green land of coconut trees, bananas, and intricate networks of mangrove swamped river ways bursting out onto the Arabian Sea. Compared to the rest of India, its people are known for their laid back, welcoming, island-like mentality; a people who are warmly proud of their rich cultural heritage that appears to exist at a different tempo from the rest of India. This collection of Kerala's temple music documents both the people and the sounds that reflect this unique way of life, a festive celebration of deeply held religious beliefs that permeate all the villages in their self proclaimed 'God's own country'. This collection constitutes part of a series published by Topic Records in conjunction with the British Library Sound Archive's International Music Collection (IMC). The archive holds an enormous collection of unique music from around the world which has been recorded in the field. 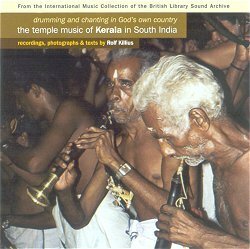 This CD provides us with a sample of Keralan temple and folk music recorded by Rolf Killius, a London based sound recorder, radio journalist, and music researcher. The recordings are taken from Central Kerala, although Killius notes that the genres featured in this collection can be heard all over the state. In Kerala, the role of Hindu temples in society, festivals, art, and leisure is so significant that temples attract huge crowds for both entertainment and devotion. These recordings thus reflect not only a ritual musical genre reserved for auspicious occasions but also a set of themes that accompany everyday life, themes that can transport the listener to the heart of Kerala's villages. The recordings are of high quality, and much of the background noise has been edited out. However, I would have personally enjoyed the extra-musical sounds coming from the ritual participants, as this often can augment the experience of listening to music recorded in its cultural context. It is worth listening carefully to track 9 in order to pick out the exuberant shouts and murmurs from the audience. This provides the only indication of the effect of the music on its listeners in its original context, which can be, after all, as significant as the music itself. The CD comprises two styles of temple music: percussion (tracks 2, 7 and 9) and vocal (1, 4, 5 and 8). Killius contrasts Keralan temple music with the Indian classical tradition, stating that unlike the classical emphasis of raga (melodic structure), rhythm invariably predominates in both the percussion and vocal styles, and that the latter are performed in temple rather than concert settings. However, he does draw interesting parallels between the rhythmic patterns characteristic of temple music and the ancient classical dhrupad genre of north India, and the hymns which we find in tracks 1, 4, 5, and 8 and the tevaram genre of Tamil Nadu. The percussion style incorporates both improvisational and compositional elements; the bandleader, who usually plays a drum, sets the pace and rhythmic development of the particular piece. The vocal style is characterised by intricate melodies, imitating the rhythmic accompaniment, and emotional content, depicting events in the narrative. The three vocal examples we hear in this CD (tracks 4, 5, and 8) are sung recitations of the Gita Govinda, a Sanskrit poem depicting stories of Krishna and the goddess Durga. They are reminiscent of the South Korean p'ansori narrative genre. These songs (Sopanam Sangeetam) are dedicated to the temple deity, and are sung in the bhakti (devotion in the form of music and poetry) tradition. The interesting and well-informed liner notes, provided by Killius himself, consist of background information including a map, a geographical and cultural description of Kerala in relation to the rest of India, several photographs of the musicians and events included in the tracks, detailed descriptions of the musical instruments featured, and an adequate examination of each of the tracks in the collection. I value Killius' description of his positioning of the microphone in conducting the recording thus directing the listener to particular instruments and their sounds. All of the tracks, except the Gita Govinda recitations (tracks 4, 5, and 8), were recorded in their original temple settings. There are, however, some discrepancies regarding performance contexts which may be misleading. For instance, while he states that Sopanam is performance almost exclusively in temples, the recordings we hear in each example of this genre (4, 5, and 8) were recorded in private homes. This raises questions regarding the authenticity of Killius' representative sample of this genre. Killius' absorbing descriptions of the particular contexts in which the performance took place give the listener an abundance of information with which to enter into the musical world. His descriptions take the form of three levels: the experiential, the ethnographic, and the musicological. He offers descriptions of the time, place, atmosphere and environment in which each track was recorded, in addition to his personal experience at the time of recording (see tracks 4 and 5), which guides the listener into as close an experience of the music as is possible. Furthermore, he provides crucial ethnographic descriptions of the point at which each performance occurred during the ritual, the legends and mythology associated with the piece, and the particular deity to whom it is dedicated. From a musicological perspective, he gives detailed analyses of the metre, genre, and general characteristics that are associated with each genre. All of these levels of documentation provide the listener with essential signposts with which s/he can enjoy the music at its different levels, as well as develop an understanding between the important relationships between these levels. In his detailed descriptions of the musical instruments, Killius illustrates each instrument in terms of its status within the ensemble, its context for performance, the genres in which it is performed, how it is played and constructed, its distinguishing sounds, its origin, tunings, and functions. While Killius' descriptions are ample, it might have been helpful to have included pictures of each instrument in order to help the listener visualise them. Technical terms and features of the performances are by and large explained well, although, on occasion, some foreign terms and genres could have been clarified better. For instance, he mentions several classical terms such as alapana and dhrupad, but fails to define them. The photos included represent a few of the performers with their instruments, as well as a couple of panoramic shots which are helpful for the listener who is trying to contextualise these sounds. In each description of the individual tracks, the names of the musicians are stated, and in some cases we learn something of their background (see especially tracks 4 and 5). All of the performers are male professionals. Most tracks are performed by less than a handful of musicians - tracks 4 and 5 are performed by one man who accompanies himself on the edaykka (a pitched 'talking drum'), although Killius uncharacteristically neglects to name the instrument in his notes. One feature I would have found valuable is the inclusion of a list of suggested further reading and listening on the topic. This would answer a number of questions that came to my mind when listening to the music and which Killius could not cover in the limited space provided in the liner notes. Such considerations as the status of musicians involved, the gender roles in the music, how the music has been influenced by neighbouring musical cultures, modernisation and globalisation, and a more detailed organology of the instruments and whether or not they are unique to Kerala, would all contribute to valuable background knowledge. While this recording provides a rich addition to the growing interest in India's regional folk styles, often it is useful to provide a more general collection of a region's music, especially since Kerala is a small state with a clearly distinguished and distinctive culture. This does not necessarily pose a problem except in the recording's capacity to attract an audience. An alternative would be to produce a recording of temple music in which there are representative examples from throughout the subcontinent, offering the listener and researcher the opportunity to contextualise and compare different regions' stylistic features. By isolating one particular region, it is easy to be misled into believing that its music and culture are monoliths. This collection, however, is a valuable contribution to both Indian folk music and traditional world music recordings. It is essential listening for anyone interested in village-based Hindu culture, in percussion genres, and religious devotional music, evoking a unique spiritual atmosphere through which generations of Keralans have sought to express their devotion. The CD offers an accessible and insightful glimpse into a hitherto unexplored genre.